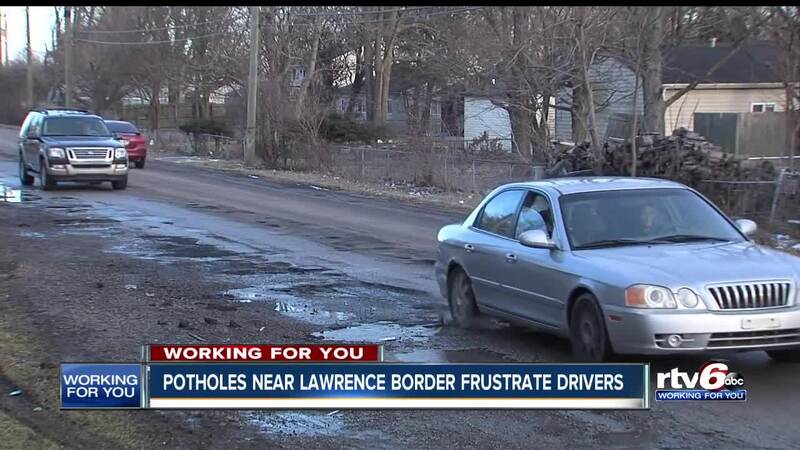 Potholes near Lawrence border frustrate drivers. INDIANAPOLIS — Moving along the stretch of 42 Street, between Franklin and Post Road, flat tires and broken rims are not an uncommon thing. Edna Kelly and Alma Phillips use 42 Street to get to church several times a week. The street is riddled with potholes. Parts of the road are crumbling after a nonstop cycle of freezing and melting this winter. "I almost got rear-ended this morning when I slowed down for one of these gigantic potholes," Kelly said. The area runs between Lawrence and Indianapolis, causing confusion over who's responsible for road repairs. "Indianapolis said it's Lawrence. Lawrence says no it's Indianapolis but I just want somebody to do something," Kelly said. RTV6 reached out to the City of Lawrence and the City of Indianapolis. Both told RTV6 that 42 Street is part of Indianapolis. Even though we now know who is responsible, that doesn't mean the problem is getting fixed anytime soon. "I know they'll probably say, 'you know, there's a whole lot of potholes.' they probably can't get here, they're everywhere at the same time," Phillips said. The city is dealing with a backlog of nearly 4,000 open service requests on it's pothole reporting website. Phillips says, "A bad accident is waiting to happen here."